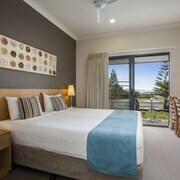 Quest Bunbury Apartment Hotel features an outdoor tennis court and an outdoor pool. Wired and wireless Internet access is complimentary. This business-friendly apartment also offers tour/ticket assistance, barbecue grills, and a garden. Complimentary self parking is available on site. Quest Bunbury Apartment Hotel is a smoke-free property. Located in the heart of Bunbury, this apartment building is within a 10-minute walk of Koombana Bay, Dolphin Discovery Centre, and Bunbury Regional Entertainment Centre. Bunbury CentrePoint and Bunbury Regional Art Galleries are also within 1 mi (2 km). This smoke-free apartment building features an outdoor pool, an outdoor tennis court, and concierge services. Free WiFi in public areas and free self parking are also provided. Other amenities include dry cleaning, free newspapers, and tour/ticket assistance. Each apartment features free WiFi and free wired Internet, plus a microwave and an LCD TV with digital channels. Additional amenities include room service, a ceiling fan, and a hair dryer. Limited housekeeping is available. 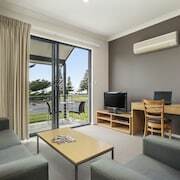 Quest Bunbury Apartment Hotel offers 52 forms of air-conditioned accommodation which are accessible via exterior corridors, and features a hairdryer and an iron/ironing board. LCD televisions come with premium digital channels. 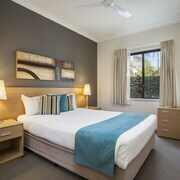 This Bunbury apartment provides complimentary wired and wireless Internet access. Business-friendly amenities include desks and telephones. Additionally, rooms include free toiletries and a ceiling fan. Housekeeping is provided on a limited basis. Recreational amenities at the apartment include an outdoor tennis court and an outdoor pool. This hotel has a strict no-party policy. Guests who book specifically to attend parties from November 19-26 will not be allowed to check in. For more details, please contact the property using the information on the reservation confirmation received after booking.